These are sometimes called Giant Orange Sedges. The question for fly fishermen seeking big trout is: "Which insects provide the best opportunity for catching such fish?" 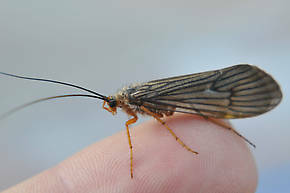 My list would be: Giant Orange Sedge (Dicosmoecus sp. 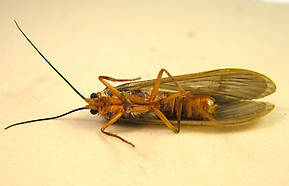 ), Salmon Fly (Pteronarcys californica, a stonefly), and the Michigan Mayfly (Hexagenia limbata). Dicosmoecus is the most important -- and the contest is not even close. Very large size: Adults 30mm long, and thick. Activity concentrated within 2-3 weeks. Emerges in the low, clear water of fall. Active during afternoon and evening. Abundant in rivers with sea-run trout. I have never fished the West to experience Dicosmoecus, but I have enough experience with Hexagenia limbata to know that a greater insect must be truly amazing.